Seraj Mirdamadi is one of dozens of journalists and civil society activists that have been arrested in Iran over just the past two months. In self-imposed exile since 2009, Mr. Mirdamadi was arrested upon his return to Iran at the time of President Rouhani’s inauguration in 2013, and he was sentenced to six years in prison on 27 July 2014. A week before, on 22 July, Washington Post correspondent Jason Rezaian and his wife, Yeganeh Salehi, a reporter with the National Emirates, were also arrested in Tehran along with another photojournalist and her husband. Without announcing any specific charges, officials have confirmed these arrests. Last week, six Special Procedures mandate holders joined me to condemn the recent wave of arrests of journalists and civil society activists in Iran, which did not end there. On 28 June 2014, journalist Mr. Mashallah Shamsolvaezin was charged with “propaganda against the state” related to interviews with media and speeches he gave at conferences. He was then released on bail of two billion riyals ($ US 66,000). On 10 June 2014, journalist Hossein Nourani Nejad, who had been in detention since April 21, was sentenced to six-years’ imprisonment for “spreading propaganda against the system” and “gathering and colluding against national security”. On 16 June he was released on bail of 3 billion rials ($US 100,000). Ms. Saba Azarpeik, a journalist who was arrested on May 28, is still in custody. For almost two months she was allegedly detained outside the system of official state detention centers. Ms. Azarpeik appeared in court on 21 and 22 July to face charges from a previous case and was reported to be in bad physical and psychological condition. On 26 May, an appeals court in the city of Ahvaz upheld the three-year sentences of three netizens detailed on charges of anti-Government publicity on Facebook, and on 22 May, Ms. Farideh Shahgholi, a German-Iranian netizen, began a three-year sentence. She was arrested in 2011 when she visited the country, and was charged with anti-government publicity and insulting the Supreme Leader, for comments she made on Facebook. Repression of social media has also been on the rise over the past few months, with users increasingly facing charges for the content they upload. In one striking example, Branch 28 of the Tehran Revolutionary Court, under Judge Moghisseh, recently sentenced 8 Facebook users to 127 combined years in prison combined, including a 20-year sentence for British-Iranian dual citizen Ms. Roya Nobakht. 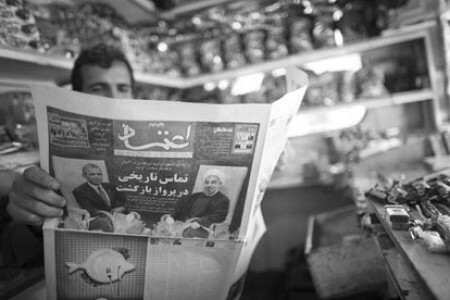 In the year 2013, 35 journalists were imprisoned in Iran. That already high figure is now increasing by the day. I urge the Iranian Government to respect the rights of journalists solely carrying out their professional activities—including the right to criticize—as protected by both Iran’s Constitution and its obligations under international human rights law. When this happens, parents will again encourage their children to enter the venerable field of journalism, rather than shy away from it due to fear.